The Huggz Hiderz from Kong are fun and soft cuddly toys for dogs. 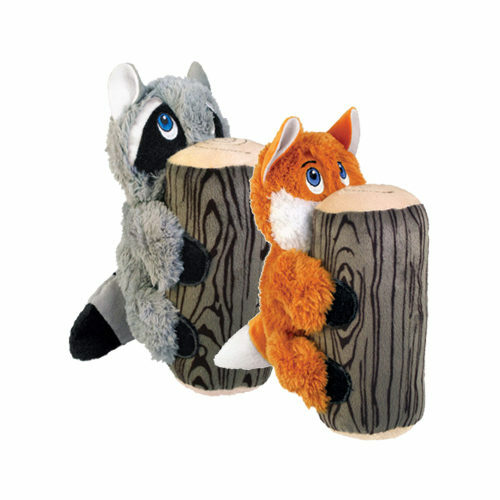 A plush fox or raccoon is hiding behind the cuddly tree trunk. Perfect toy for playing or cuddling. The tree trunk has a large squeaker for additional playing fun. The KONG Huggz Hiderz is a cute, soft dog cuddly toy with different textures. The toy is made from double fabric, so your four-legged friend can enjoy this cuddly toy for a long time. This is the perfect toy for playing or cuddling. A plush fox or raccoon is hiding behind the tree trunk. A large squeaker is incorporated into the tree trunk. Have you used KONG Huggz Hiderz before? Let us know what you think about this product.